Picture - The VL Humu at Central Finland Aviation museum. VL Humu was a Finnish fighter aircraft, designed by the State Aircraft Factory (Valtion lentokonetehdas) in 1944. The Humu was based on the American Brewster F2A design. Humu was largely constructed out of wood due to scarcity of metals, but the frame was made from steel and its design followed closely the one of the Brewster. Due to the small numbers of Brewsters in service (44) in the Finnish Air Force, the Finns wanted to see if they could design a fighter, based on the Brewster design. The aircraft designers Torsti Verkkola, Arvo Ylinen and Martti Vainio were called upon to lead the project. 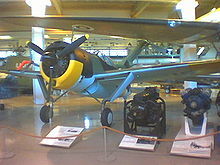 The Finnish Air Force ordered 90 Humus, however, the production was stopped in 1944, when only one aircraft had been produced. This aircraft carried the call signal HM-671. The first flight took place on August 8, 1944. The HM-671 flew altogether for a total 19 hours and 50 minutes. The aircraft was 250 kilograms heavier than calculated, its engine too weak and the aircraft was simply not of the standard expected from a fighter aircraft of 1944. It was noted that the change from wing guns to fuselage mounted machine guns was a good change. The HM-671 has been fully restored and is displayed at the Central Finland Aviation museum.